Is a psychotherapist licensed as a Marriage and Family Therapist in the State of California, and living in Orange County. She received her Masters Degree in Marriage and Family Therapy from the University of Southern California (USC). Before founding the Center for Anxiety and OCD, Sheva was trained in behavioral therapy at the UCLA Semel Institute for Neuroscience and Human Behavior. While there, Sheva primarily treated children with Autism to improve social, cognitive and developmental functioning. She also worked at the UCLA Social Stigma and Social Interaction laboratory, where she studied the effects of social stigma on performance. Next, Sheva trained at the Southern California Counseling Center, where she treated individual clients, couples, families and groups, focusing her training on CBT for the treatment of OCD and related anxiety disorders. Most recently, Sheva worked as a psychotherapist at the OCD Center of Los Angeles, where she specialized in the treatment of all types of anxiety disorders, and body focused repetitive behaviors (BFRB’s), placing a special emphasis on relationship based anxiety (ROCD) and pure obsessional OCD (Pure-O). A native Angeleno, Sheva is fluent in English and Farsi. She has a passion for helping her clients achieve a new level of understanding in their lives, and guiding them on their path towards finding real relief from anxiety disorders. See her discuss her experience with her own anxiety on the TED stage below. Is a licensed Marriage and Family Therapist in the State of California, who was born and raised in Orange County. She received her Masters Degree in Marriage and Family from the University of Southern California (USC) and her Bachelors Degree in Psychology with a minor in Applied Psychology from UC Santa Barbara (UCSB). Before working at CAOCD, Rebeca was trained in Applied Behavioral Analysis (ABA) and worked with children with Autism before moving on to advance her training with individuals, couples and families at the Richstone Family Center. There, Rebeca became the lead group facilitator for Parent Support Groups, Mindfulness Groups, and Anger Management Groups and discovered a passion for working with anxiety disorders. Skilled in the use of Cognitive Behavioral Therapy (CBT), Mindfulness strategies and Exposure and Response Prevention (ERP), Rebeca has worked closely with Sheva to become specialized in the treatment of a variety of anxiety disorders including Body Focused Repetitive Behaviors (BFRB), Social Anxiety, Panic Disorder, Generalized Anxiety Disorder and Obsessive Compulsive Disorder (OCD.) She prides herself on developing a deep connection to her clients and creating the warm therapeutic relationship needed to achieve results. Is a licensed psychotherapist in the State of California. She received her Masters Degree in Marriage and Family Therapy from Antioch University and her Bachelors Degree in Sociology with a minor in Human Complex Systems from University of California, Los Angeles (UCLA). Prior to working at CAOCD, Samira was trained in working with children with autism, conduct disorder, ADHD, and other related disorders at Cheerful Helpers. She also worked as an MFT intern at The Maple Counseling Center. There, she worked with adolescents in individual and group therapy at multiple high schools focusing on anxiety and depression. Samira then worked as a licensed psychotherapist at the Center for Family Health and Education treating individuals, couples, and families. She has worked with many issues such as anxiety, depression, and personality disorders. Samira is also fluent in English and Farsi. 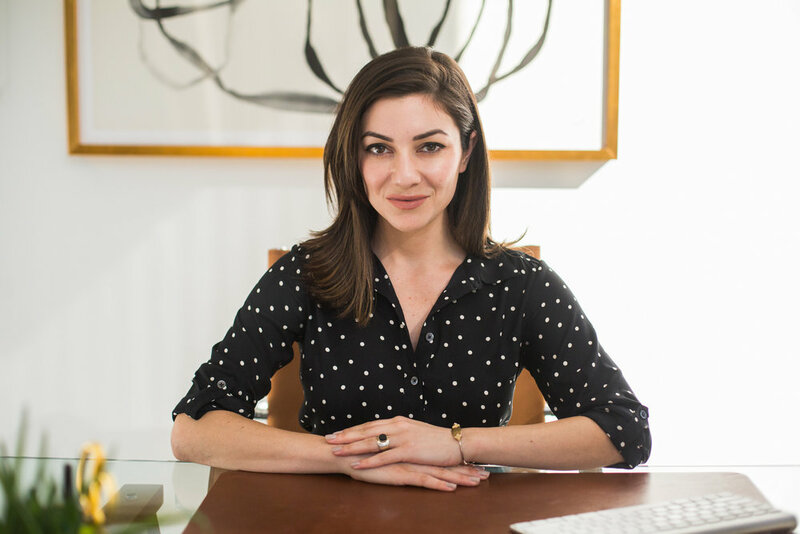 Most recently, Samira worked as a licensed psychotherapist at Anxiety Therapy LA, where she specialized in treating children, adolescents, and adults with anxiety and OCD. She is skilled in the use of Cognitive Behavioral Therapy (CBT), Exposure and Response Prevention (ERP), and mindfulness, and has continued to expand her education and expertise at CAOCD. Samira places emphasis on a mindful, positive, and strength-based approach with clients. Her hope is to help the client feel empowered and create a positive outlook throughout their journey and recovery from anxiety disorders and OCD. Is studying Psychology and Human Behavior at the University of California, Irvine and hopes to continue her education to become a psychotherapist in the future. Nicolette has traveled extensively and brings multicultural competency as well as a personal history with anxiety disorders to her work. As the first point of contact at the Center for Anxiety and OCD, Nicolette introduces clients to the therapeutic program and helps clients and their families navigate the often confusing process of choosing the program and therapist that is right for them.